An Indian Pattern Carrier Mk IIA, Dhar IV in North Africa of the type used by 3rd Indian Motor Brigade. The 3rd Indian Motor Brigade was formed in 1940 by the Indian Army during World War II. In 1941, the brigade was surrounded at Mechili by Axis forces during Operation Sonnenblume and suffered many casualties, breaking out of the encirclement. One cavalry regiment then took part in the Siege of Tobruk and then the brigade was reconstituted in Egypt. In August, the brigade, under Brigadier A. A. E. Filose, was re-equipped at Mena in Egypt and in September moved to north-east Syria. In May 1942, during the Battle of Gazala the brigade held a defensive box at Point 171 near Bir Hakeim and was again overrun by units of the Afrika Korps and Italian forces. On 28 May, the remnants of the brigade were sent back to Buq Buq to reform and about 800 of the men taken prisoner rejoined soon afterwards. The Axis had released 600 prisoners from captivity after 48 hours, due to a water-shortage, who reached the Free French fighting the Battle of Bir Hakeim (26 May – 11 June) and another 200 men were liberated by a British column. The British Indian Army during World War II began the war, in 1939, numbering just under 200,000 men. By the end of the war, it had become the largest volunteer army in history, rising to over 2.5 million men in August 1945. Serving in divisions of infantry, armour and a fledgling airborne force, they fought on three continents in Africa, Europe and Asia. Mechili is a small village in Cyrenaica, Libya and the site of a former Turkish fort. It is nearly 274 km (170 mi) east of Benghazi and 80 km (50 mi) west of Timimi. In July the remaining units of the brigade were dispersed and allotted to the defence of the Nile Delta. In August the brigade was reformed, less the 2nd Field Regiment RA. The brigade then moved to Sahneh in Iran via Baghdad, under the command of the 31st Indian Armoured Division. In late November, it moved to Shaibah near Basra. The cavalry regiments of the brigade returned to India in January 1943 and were replaced by the 2nd Battalion, 6th Gurkha Rifles, 2nd Battalion, 8th Gurkha Rifles and the 2nd Battalion, 10th Gurkha Rifles, the brigade being renamed the 43rd Indian Infantry Brigade (Lorried). The Nile Delta is the delta formed in Northern Egypt where the Nile River spreads out and drains into the Mediterranean Sea. It is one of the world's largest river deltas—from Alexandria in the west to Port Said in the east, it covers 240 km (150 mi) of Mediterranean coastline and is a rich agricultural region. From north to south the delta is approximately 160 km (99 mi) in length. The Delta begins slightly down-river from Cairo. Sahneh is a city in and the capital of Sahneh County, Kermanshah Province, Iran. At the 2006 census, its population was 34,133, in 8,861 families. The 18th King Edward's Own Cavalry was a regular cavalry regiment in the British Indian Army. It was formed in 1921 by the amalgamation of the 6th King Edward's Own Cavalry and the 7th Hariana Lancers. 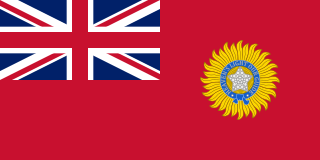 These regiments served the British Crown from before the Indian Mutiny to World War II. The 31st Indian Armoured Division was an armoured division of the Indian Army during World War II, formed in 1940, originally as the 1st Indian Armoured Division; it consisted of units of the British Army and the British Indian Army. When it was raised, it consisted of two Armoured Brigades and one Motor Brigade. Lieutenant General Sir Philip Neame, was a senior British Army officer and a recipient of the Victoria Cross, the highest award for gallantry in the face of the enemy that can be awarded to British and Commonwealth forces, and the winner of an Olympic Gold medal; he is the only person to achieve both distinctions. Martuba is a town in eastern Libya in the Derna District. It is located at 32.575739n, 22.761505e, 27 km (17 mi) south of Derna and 557 miles from Tripoli and the city's population is 8,130. Derna is a port city in eastern Libya. It has a population of 100,000–150,000. It was the seat of one of the wealthiest provinces in the Barbary States, and remains the capital of the Derna District, with a much smaller area. Derna has a unique environment among Libyan cities, as it lies between green mountains, the Mediterranean Sea, and the desert. The city is also home to people of mixed origins. And so the brigade group was ready to move and at the allotted time the signal code was hauled up above the Brigade Major's vehicle and the group moved off as one vehicle; the sight of a thousand vehicles of all types, moving in formation, across a fairly level plain was a sight that one could never forget. Down through the years before the war whilst training in the Militia I had worked out exercises and manoeuvres on sand tables and blackboards, but never did I imagine that such a huge force could be controlled as perfectly as was the 3rd Indian Motor Brigade and its attached troops on that morning. Major-General Michael Denman Gambier-Parry was a senior British Army officer who commanded the 2nd Armoured Division during the Western Desert Campaign of World War II. The Fieseler Fi 156 Storch was a small German liaison aircraft built by Fieseler before and during World War II. Production continued in other countries into the 1950s for the private market. It remains famous for its excellent STOL performance and low stall speed of 31 mph(50 kmph); French-built later variants often appear at air shows. ... any fully-motorised force whose organisational structure remains intact will normally and in suitable country be able to break out at will through an improvised ring. Thanks to his motorisation, the commander of the encircled force is in a position to concentrate his weight unexpectedly against any likely point in the ring and burst through it. This fact was repeatedly demonstrated in the desert. 1 2 Playfair 2004, p. 8. ↑ Maughan 1966, p. 63. ↑ Playfair 2004, pp. 8–9. 1 2 3 4 Maughan 1966, p. 77. 1 2 Mackenzie 1951, p. 72. 1 2 3 Mackenzie 1951, pp. 72–73. ↑ Maughan 1966, p. 83. 1 2 Maughan 1966, p. 84. ↑ Maughan 1966, pp. 84–87. 1 2 Maughan 1966, p. 89. ↑ Maughan 1966, pp. 101–102. 1 2 3 Maughan 1966, p. 102. ↑ Playfair 2004a, p. 30. ↑ Maughan 1966, p. 103. ↑ Mackenzie 1951, p. 73. ↑ Maughan 1966, pp. 102–104. ↑ Maughan 1966, p. 104. 1 2 Maughan 1966, p. 105. ↑ Maughan 1966, pp. 106–107. ↑ Maughan 1966, pp. 107–108. ↑ Maughan 1966, p. 108. 1 2 Maughan 1966, p. 109. ↑ Mackenzie 1951, p. 74. 1 2 Mackenzie 1951, p. 146. ↑ Mackenzie 1951, pp. 146–147. 1 2 3 Mackenzie 1951, p. 543. 1 2 3 Carver 2002, p. 65. ↑ Mackenzie 1951, pp. 543–544. ↑ Playfair 2004a, p. 223. ↑ Mackenzie 1951, pp. 545–546. ↑ Mackenzie 1951, p. 546. ↑ Carver 2002, p. 127. 1 2 Mackenzie 1951, pp. 579–580. ↑ Playfair 2004a, pp. 285, 289. 1 2 Chappell 1993, p. 22. ↑ Jackson 2004b, pp. 55, 225, 233, 257–258. ↑ Jackson 2004b, pp. 274–275, 278. ↑ Jackson 2004b, pp. 402–404. ↑ Jackson 2004c, pp. 34–35, 117, 122–123. ↑ Jackson 2004c, pp. 223, 226. 1 2 Jackson 2004c, pp. 270–271, 278–279. ↑ Jackson 2004c, p. 324. ↑ Kay 1967, pp. 520. ↑ Playfair 2004a, pp. 28, 30. ↑ Mackenzie 1951, pp. 71–72. The First Battle of El Alamein was a battle of the Western Desert Campaign of the Second World War, fought in Egypt between Axis forces of the Panzer Army Africa and Allied forces of the Eighth Army. Operation Battleaxe was a British Army operation during the Second World War in June 1941, to clear eastern Cyrenaica of German and Italian forces and raise the Siege of Tobruk. It was the first time during the war that a significant German force fought on the defensive but the operation failed as British forces attacked strong defensive positions created by German General Erwin Rommel. The British lost over half of their tanks on the first day and only one of the three attacks succeeded. The Battle of Gazala was fought during the Western Desert Campaign of the Second World War, west of the port of Tobruk in Libya, from 26 May to 21 June 1942. Axis troops of the Panzerarmee Afrika consisted of German and Italian units. Allied forces were mainly British, Indian, South African and Free French. The 8th Mountain Division was raised as the 8th Indian Infantry division of the British Indian Army. It is now part of the Indian Army and specialises in mountain warfare. The 2nd Armoured Division was an armoured division of the British Army, active during the Second World War. The division was created on 15 December 1939 and disbanded on 10 May 1941, after part of the division was captured at Mechili in Libya from 5 to 8 April 1941, by German and Italian forces during the Western Desert Campaign and part was lost in the Battle of Greece (6–30 April). The rapid British advance during Operation Compass forced the Italian 10th Army to evacuate Cyrenaica, the eastern province of Libya. In late January, the British learned that the Italians were retreating along the Litoranea Balbo from Benghazi. The 7th Armoured Division was dispatched to intercept the remnants of the 10th Army by moving through the desert, south of the Jebel Akhdar via Msus and Antelat as the 6th Australian Division pursued the Italians along the coast road, north of the jebel. The terrain was hard going for the British tanks and Combeforce, a flying column of wheeled vehicles, was sent ahead across the chord of the jebel. Iraqforce was a British and Commonwealth formation that came together in the Kingdom of Iraq. The formation fought in the Middle East during World War II. The Second Battle of El Alamein order of battle is a listing of the significant formations that were involved in the Second Battle of El Alamein during the Western Desert Campaign of the Second World War, 23 October – 4 November 1942. The Action at Mechili was an engagement between Commonwealth and Italian forces during Operation Compass. 17th Infantry Division "Pavia" was an auto-transportable Infantry Division of the Italian Army during World War II. The Pavia was formed in October 1939 and sent to Libya. It was never completely motorised as a formation. It was almost destroyed during the Second Battle of El Alamein. The Pavia was classified as an auto-transportable division, meaning staff and equipment could be transported on cars and trucks, although not simultaneously. The Moro River Campaign order of battle is a listing of the significant formations that were involved in the fighting during the Moro River Campaign in December 1943, part of the Italian Campaign of World War II. Combeforce or Combe Force, was an ad hoc flying column formed from parts of the 7th Armoured Division of the Western Desert Force. The rapid British advance during Operation Compass forced the Italian 10th Army to evacuate Cyrenaica, the eastern province of Libya. In late January, the British learned that the Italians were retreating along the Litoranea Balbo from Benghazi. The 7th Armoured Division was dispatched to intercept the remnants of the 10th Army, by moving through the desert, south of the Jebel Akhdar via Msus and Antelat, as the 6th Australian Division pursued the Italians along the coast road, north of the jebel. The terrain was hard going for the British tanks and Combeforce, with the wheeled vehicles of the 7th Armoured Division, was sent ahead across the chord of the jebel. The First Battle of Bir el Gubi took place on 19 November 1941 near Bir el Gubi, Libya. 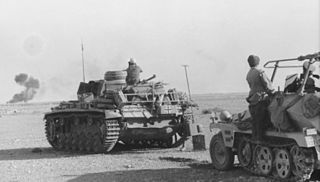 It was one of the opening engagements of Operation Crusader and the first tank battle in North Africa where Italian armoured forces achieved a success, after their previous poor performance during Operation Compass. Carver, M. (2002) . Dilemmas of the Desert War: The Libyan Campaign 1940–1942 (Spellmount, London ed.). Staplehurst: Batsford. ISBN 978-1-86227-153-1. Chappell, M. (1993). The Gurkhas. Elite (repr. ed.). Oxford: Osprey. ISBN 978-1-85532-357-5. Jackson, General W. G. F.; et al. (2004) [1st. pub. HMSO 1987]. Butler, J. R. M., ed. The Mediterranean and Middle East: Victory in the Mediterranean, June to October 1944. History of the Second World War United Kingdom Military Series. VI. Part II (Naval & Military Press, Uckfield ed.). London: HMSO. ISBN 978-1-84574-071-9. Jackson, General W. G. F.; et al. (2004) [1st. pub. HMSO 1988]. Butler, J. R. M., ed. The Mediterranean and Middle East: Victory in the Mediterranean, November 1944 to May 1945. History of the Second World War United Kingdom Military Series. VI. Part III (Naval & Military Press ed.). London: HMSO. ISBN 978-1-84574-072-6. Kay, Robin (1967). Italy: From Cassino to Trieste. The Official History of New Zealand in the Second World War 1939–1945. II (New Zealand Electronic Text Collection ed.). Wellington, New Zealand: Historical Publications Branch. OCLC 173284646 . Retrieved 4 March 2016. Mackenzie, Compton (1951). Eastern Epic: September 1939 – March 1943: Defence. I. London: Chatto & Windus. OCLC 59637091. Maughan, Barton (1966). "Chapter 3: The "Benghazi Handicap"". Tobruk and El Alamein. Official History of Australia in the Second World War Series 1 (Army). III (online ed.). Canberra: Australian War Memorial. OCLC 954993 . Retrieved 8 March 2016. Playfair, I. S. O.; et al. (2004) . Butler, J. R. M., ed. The Mediterranean and Middle East: The Germans come to the help of their Ally (1941). History of the Second World War United Kingdom Military Series. II (Naval & Military Press ed.). London: HMSO. ISBN 978-1-84574-066-5 . Retrieved 25 June 2014. Playfair, Major-General I. S. O.; et al. (2004) [1st. pub. HMSO 1960]. Butler, J. R. M., ed. The Mediterranean and Middle East: British Fortunes reach their Lowest Ebb (September 1941 to September 1942). History of the Second World War United Kingdom Military Series. III. Naval & Military Press. ISBN 978-1-84574-067-2. Efendi, M. Y. (2007). Punjab Cavalry: Evolution, Role, Organisation and Tactical Doctrine: 11 Cavalry (Frontier Force) 1849–1971. Karachi: Oxford University Press. ISBN 978-0-19-547203-5. Kempton, Chris (2003). Loyalty & Honour: The Indian Army, September 1939 – August 1947. Westoning, Beds: Military Press. ISBN 978-0-85420-223-2. Sandhu, (PVSM) Retd., Major General Gurcharn Singh (1991). I Serve. Saga of the Eighteenth Cavalry. New Delhi: Lancer International. ISBN 978-81-7062-104-1. Vaughan, Brigadier E. W. D. (1951). A History of the 2nd Royal Lancers (Gardner's Horse) (1922–1947). London: Sifton Praed. OCLC 15003418.